Search for the best flight prices from Manchester to Cork. Compare prices, book today and save money with Manchester Airport. Corkonians cheekily refer to their home as ‘the real capital of Ireland’ – and it’s easy to see why. With the world’s second largest natural harbour (after Sydney) and a beautiful riverfront setting, the city has much to offer the senses. Venture further afield and there’s stunning countryside just moments from the city limits. And if you fancy a walk, the European walking route E8 trail starts here... and ends 4700 km away in Istanbul. 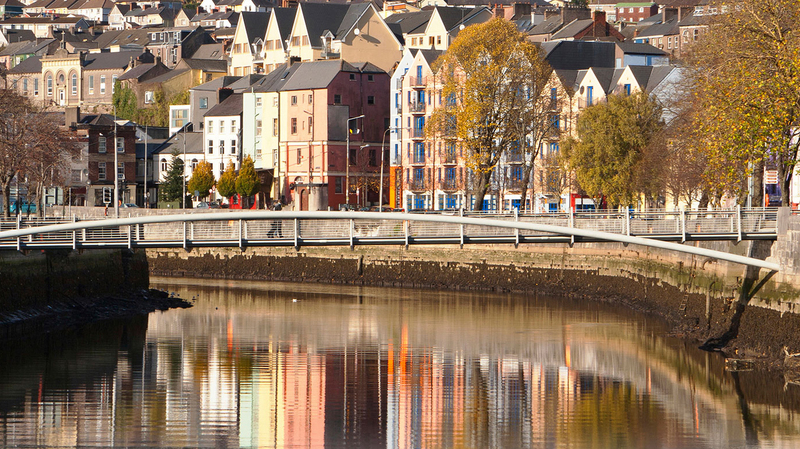 From grand country houses to farmhouse B&Bs, boutique lodgings and traditional hotels, Cork has a wide selection of accommodation. A 15-minute walk from central Cork, five-star Hayfield Manor (Perrott Avenue) lets you feel lord of the manor for a while. Moderately priced guesthouses are two-a-penny, but Garnish House (Western Road) stands out thanks to a friendly owner, freshly baked goodies and spectacular breakfasts. Or, to be plumb in the centre of town with river views and antique fittings, try The Gresham Metropole (MacCurtain Street), a grand hotel that was built in 1897 and is a mid-range favourite. Cork is a compact city that’s well suited to shoppers. It has everything from quirky little side street boutiques to splendid Victorian arcades and monster malls. St Patrick's Street is the city’s shopping backbone, while the neighbouring Opera Lane is its newest retail thoroughfare. The old Cornmarket (Cornmarket Street) building is now a shopping centre, and there are even bigger developments in the suburbs. Food shoppers should look no further than the 18th-century English Market (Grand Parade). Shopaholics will find a host of items in the flagship Dunnes (Patrick Street) department store, which first opened in 1944. Typical souvenirs from Cork include local whiskey, stouts, woollen goods, crystal and ceramics. Cork is one of southern Ireland’s best foodie destinations thanks to fresh farm produce, top chefs and a quirky range of venues. A true picnicker’s paradise, the English Market (Grand Parade) has a bounty of local cheeses, meats, fish, seafood, sausages, black pudding and breads – go up to the mezzanine for a sit-down meal made with the freshest market produce in the Farmgate Café. Upmarket Café Paradiso (16 Lancaster Quay), meanwhile, is one of Ireland’s finest and most inventive vegetarian restaurants. For a treat, book a table at time-honoured Jacques Restaurant (23 Oliver Plunkett Street) or opt for quirky Irish-Japanese spot Ivory Tower (35 Princes Street). One of Europe’s top choral events, this festival takes place in the five days leading up to the first Monday in May. Most performances and competitions take place in Cork’s City Hall, while fringe events are housed in churches across Cork. This all-embracing arts festival brings top international names and home-grown Irish talent to Cork with a series of performances over 10 days, starting on Midsummer’s Day. Anywhere can be turned into a performance venue, from the roof of City Hall to a factory floor. Ireland’s biggest jazz festival has been running since 1978, drawing tens of thousands of fans to Cork every year. Many of the greats, from Ella Fitzgerald to Dizzy Gillespie, have performed at this event over the years. The festival lasts for four days and embraces more than 1,000 musicians from all over the world. Traditional music reigns supreme for four days each October, when the Cork Folk Festival comes to town. This lively event features concerts, impromptu sessions, talks, workshops and special events for kids. Lovers of Irish cinema flock to Cork for this week-long festival, which has been running since 1956. This big-screen feast covers everything from feature films to documentaries.